With two days at Disneyland and another booked at Sea World the next day before we left for Las Vegas, we were running out of time to explore Los Angeles. We had no rental car, no idea how the public transport system worked and we were on a tight budget. 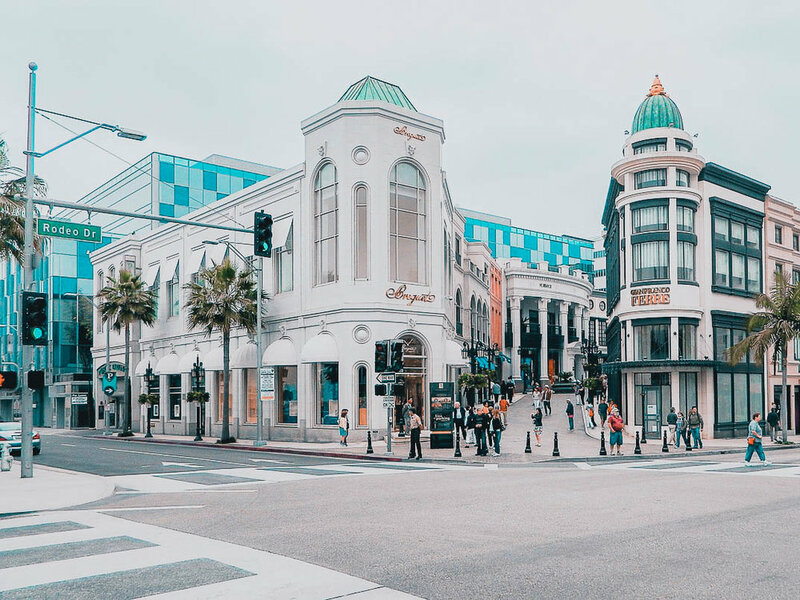 We really wanted to explore Los Angeles, see Hollywood and poke around The Grove, but how were we supposed to pack all of that into the one tiny day we had left? We’d heard about those bus tours of Los Angeles but we were hesitant to book a tour as we weren’t sure whether they would be worth the money. However, it was late and we were on a time crunch. Our receptionist suggested Starline Tours and even offered to book them in for us. It was USD$69 per person and I drew in a breath. I couldn’t help but wonder as the receptionist picked up the phone: “Is this going to be worth the money?” We had one tiny, precious day to see a city I’d been dreaming of my entire life and I was afraid I was going to miss out and squander our money. I’d researched LA tours before on Trip Advisor and reviews were always mixed at best. As I watched the sleek Starline Tours shuttle bus pull up in the parking lot of our hotel, I had no idea what to expect. What would we actually see? Where would we actually go? Would our tour bus driver monotonously point out celebrity homes from a distance as he whizzed past them on the freeway? Would we get stuck in traffic and not actually see anything? Was this all just going to be a big scam? I need not have worried. Our Starline Tours Grand City Tour of Los Angeles was one of the highlights of our LA trip. Our amazing driver packed in so much extra value and kept us entertained, laughing and joking the entire time with his humor and extensive local’s knowledge. We ticked so many sights off our bucket list and gushed like tourists at landmarks we’d only ever seen before in movies. If you’re anything like me, you’ve probably Googled whether to bother with a Los Angeles bus tour and wondered what to expect. You’re probably worried as hell about whether to part with your hard earned $$$. Oh sure, they make it look impressive in the glossy brochure, but what is it actually like? Where do they actually stop? Well, you’re about to find out. So, how did the day go down? We woke up at 8 am, bleary-eyed and kind of sore from two massive days at Disneyland, with a sinking feeling. There was only one day up our sleeve to explore Los Angeles. We had no car. Neither of us had a clue how the public transport system worked. Plus, as our accidental trip to Seal Beach had taught us, we really knew nothing about the city’s size. Worst of all, it was already 8 o’clock and we hadn’t booked a tour. We went down the hall to the reception desk. The receptionist told us that he could organize a tour of Los Angeles if we wanted. However, we needed to hurry, as they were already on their pickup rounds. We locked it in. A shuttle bus arrived very soon after and we clambered aboard. There were a few other people already aboard: two retired women and another couple. The shuttle bus headed for the Disneyland precinct. Here, as I cast a longing gaze at the entrance to Disney, a young family from New Zealand joined us, and then we made our way to the Starline Tours station. Swapping our shuttle bus for a gigantic black coach, we met with our driver Albert: larger than life, with a dry, irreverent sense of humor, who put us instantly at ease. He was absolutely hilarious, and one of those people you instantly feel like you’ve known for years. By the time our bus entered the freeway, we felt like a busload of old friends. As always, the LA traffic was thick, though not congested, and we cruised along at a leisurely pace toward Downtown Los Angeles. Albert kept talking through his mic the whole time, alternating between gently teasing us and the Kiwi about our “version of” football to pointing out landmarks along the way, occasionally injecting humorous personal anecdotes. As we were driving along, Albert asked if it would be okay with us if he gave us the option to pick between a certain destination and a “need to know”. This “need to know” wouldn’t be on the brochure, but was a special bonus off the beaten path. We eagerly agreed. I’ll never forget our first glimpse of the Hollywood sign. It’s the part of the tour, Albert said, where the whole bus oohs and ahhs. That was certainly true for us! I almost collapsed with excitement at the first sight of it – tiny but clearly distinguishable in the distance. But Hollywood wasn’t on our tour radar just yet. Albert first took us to Downtown LA. We drove past Chinatown. We saw the Walt Disney Concert Hall, a beautiful and sombre silver and white building. Albert told us that Lillian Disney, Walt’s wife, gifted $50 million to the people Los Angeles for the building of the concert hall, and intended it as a tribute to her husband Walt. From there, we headed off on a “need to know” tangent, driving by the house where The Fast and the Furious was filmed, as well as the house where Charmed was filmed. By mid-morning, we had pulled into beautiful Olvera Street, one of the oldest parts of Los Angeles. Beautifully painted with beautiful murals and lined with colourful Mexican markets, Olvera Street is well worth a day to explore on its own. We had only a short morning tea break, but it was enough to wander through the markets and explore the beautiful, hand-painted Mexican curios. I bought a beautiful hand painted sugar skull to add to my curios collection and it was time to hurry back onto the bus. Before long, we reached Hollywood, driving down legendary Hollywood Boulevard. It was a sight to behold. It was kind of not what I was expecting and yet exactly what I was expecting at the same time. Everywhere we looked there were people dressed up in very realistic movie costumes. The streets were paved with stars set in tribute to famous entertainers. We drove past the TCL Chinese Theatre. A tow truck was removing the actual Batmobile from the street. Albert explained to us that the creator of Batman, Bob Kane, was posthumously awarded a Hollywood star that very morning. The Batmobile on the street was the one from Batman vs Superman. Albert diverted into a side street, where he pulled over so we could get out and explore. He left us with a word of warning about getting a photo with the costumed characters on the street. They would offer to take a photo with you and then expect you to pay them for it. He suggested if you didn’t want to pay for a photo with Catwoman, keep your head down and keep walking. He gave us an hour to explore, and we set off for Hollywood Boulevard. Greg and I had no real plan, and that’s kind of something I regret in hindsight. I saw a man dressed as Wolverine who looked so much like the actual Hugh Jackman I had to do a triple check to convince myself it wasn’t him but I remembered Albert’s word of warning. 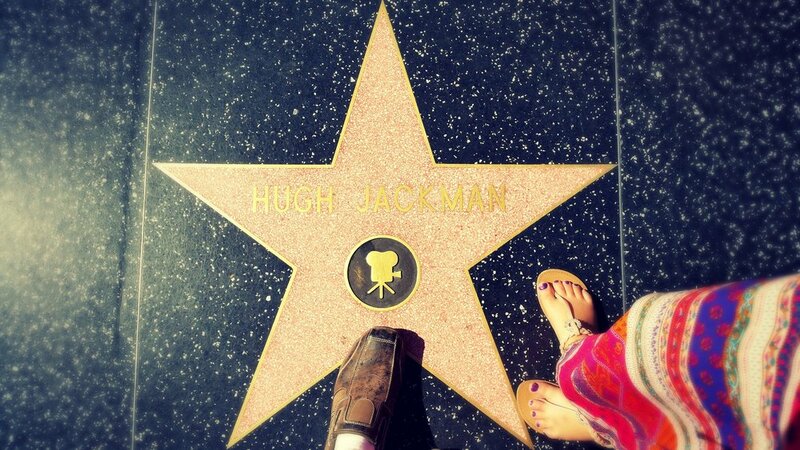 I settled for a photo of Hugh Jackman’s star on the Hollywood Walk of Fame instead. Halfway down the Boulevard, we met with a young man who told us he was a young aspiring rapper. He asked our names. We told him and he pulled out a CD and wrote our names on it and signed it like a celebrity. He then said he wanted to give it to us so we could spread the word about his music. Our names were already on the CD when he was suddenly asking us to pay $30 for it. We said no and the situation began to escalate. Another man came over and started getting quite terse with us, despite our insistence that we never wanted the CD. Eventually, Greg grabbed my hand and pulled me away at a brisk pace. It was literally the only bad experience we had in the USA and they almost suckered us right in. If you have people approach you on the Boulevard, especially “budding young musicians”, keep walking. We explored Hollywood and Highland, a shopping precinct with outlets like Guess and Sephora. Because I have no self control at Sephora and would have chewed up the entire excursion time, I didn’t venture in. From the top level of Hollywood and Highland, you can sneak in a good view of the Hollywood sign. We also poked around in a few tourist souvenir shops. We felt like the smaller souvenir shops on the Boulevard are a little “tourist trappy”. However, a souvenir shop worth stopping in for a look is La La Land on the corner. Their range of gifts and souvenirs is extensive. Coolest of all, you can check out Elvis’ powder blue Cadillac, as well as an impressive statue of Spiderman. Spiderman, my nephew’s favourite. This one’s for you, buddy. With more time or more knowledge of what was around to spare, I think I would have really liked to explore Dolby Theatre and TCL Chinese Theatre. I recommend researching what’s around in Hollywood before your tour so that you can maximise the short amount of time you have there. As our time in Hollywood drew to an end, I’ll admit I was glad to get back on the bus. The part of Hollywood Boulevard that we explored probably wasn’t what we were expecting. I felt like it reminded me a lot of Surfers Paradise and seemed a bit “touristy”. Had we planned this tour in advance I would have researched a bit of a plan for our brief stop so we could have made the most of it. All in all though, getting to walk Hollywood Boulevard, take photos of a few stars on the Hollywood Walk of Fame and the Hollywood sign was definitely one to cross off the bucket list, especially for a movie buff like me! Greg and I exchanged looks. We were glad we had just kept walking!!! However, another man in our party had not been so lucky. They had pressured him into buying the CD. It turned out to be just a blank CD with nothing on it. He’d paid $30 for a souvenir of the time he got scammed on Hollywood Boulevard. Departing Hollywood, we drove past The Hollywood Bowl and the Hollywood United Methodist Church, which was the filming location for Sister Act and Back to the Future, before climbing the hills. After getting a closer look at the Hollywood Sign we pulled over at Jerome C Daniel Overlook, overlooking the Hollywood Bowl. We were allowed to get out there and snap some photos. The view was breathtaking! Continuing our tour of the Hollywood Hills, Albert pointed out Jack Nicholson’s house in close proximity. Greg tried to take a photo. Then I got a mental picture and it gave me nightmares later. We passed other homes in the Hollywood Hills: Katy Perry’s house (she has like three different houses on the one property) and Jason Statham’s house, to name a few. We knew the latter was his because he proudly hung a Union Jack out the front. “Man’s got to represent, I guess,” Albert shrugged. He also pointed out Bruno Mars’ house, where he said his guests got a surprise visit from the singer on one tour. Albert gave us another stop at The Narrows Overlook on Mulholland Drive. We had plenty of time to take in the view and snap some pics. The next destination on our list was Beverly Hills and Rodeo Drive, baby. We didn’t get out and stop here, but it was enough to get to see it with my own eyes. I hummed Pretty Woman to myself the entire time. After driving down the iconic Sunset Strip and seeing the rock and roll factory club, Whiskey-A-Go-Go, Albert announced that we would head to The Grove. We would stop there for an hour to buy some lunch if we were hungry, or do some shopping. The Grove is an outdoor shopping and dining complex featuring a trolley car going through the center. The energy and buzz there is bright and chill and drenched with Californian sunshine. Crunched for time, Greg and I sat down for burgers and a drink each. By the time we ordered, waited for and ate our food it was time to head on back. Now full disclosure here: a belly full of a delicious, greasy, pickle infused, sauce dripping American burger (the way they should be) and a glass of wine left me pretty full and tired. Plus, I’d done two big days at Disney the day before and I was getting over jet lag, so I may have fallen asleep on the bus after this juncture. Greg stirred me awake when we arrived at LA Live, an entertainment precinct in Downtown Los Angeles. We got out at the Staples Centre, home of the LA Lakers, and took some photos. The sun was starting to set, and we were still out on the tour. It was only supposed to go for seven hours, but Albert was dedicated to packing extra value into our tour. He had taken us to a lot of bonus “need to know” sights off the beaten path and let us stop for longer in certain places so that we could take photos and have an explore. All in all, he had given us literally hours of extra value and extra stops so that we could make the most of our day. He seemed truly proud and only too happy to show off his home city. We could tell he was proud of it and proud of what he did and his passion truly shone through. When we finally got back onto the bus, we hit LA peak hour traffic, so we didn’t get to our hotel room until late at night. As tired as we were though, we were absolutely on a buzz! We had such a great time that the day just flew by. Albert had jam-packed in so much value, we thought we should have paid more for the tour. We made sure to hand over a good tip and even then, I thought he was worth so much more. He really went the extra mile and made the tour a special experience. The promise of a giant cheese pizza, American cable and our $5 1 L bottle of wine awaited in our hotel room to cap off a fantastic day. It had seemed impossible when we woke up that morning that we would get to see the highlights of Los Angeles in just one day, but we had – and then some. Believe me, I was just as skeptical about booking a bus tour of Los Angeles as you are. But I couldn’t have been more wrong. The Starline tour of Los Angeles absolutely blew me away. We ventured off the beaten path and got a real local expert’s look at such a diverse, iconic and historical city. The price of the tour is fantastic value for money and worth every cent. 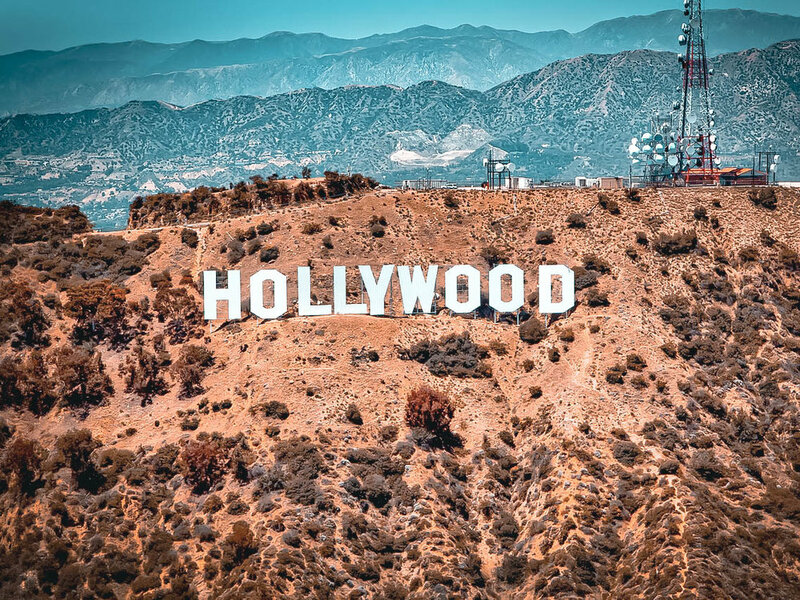 If you’ve only got a short amount of time and a limited budget within which to explore Los Angeles, I highly recommend booking a Starline Tour of Los Angeles, which you can book through your hotel or an online agent such as Viator. If you’re based in Anaheim, Starline Tours comes right to your door and drop you back right out the front at the end of the day. We stayed at Hotel Pepper Tree, Anaheim. We cannot recommend it highly enough. It was fantastic value for money with beautifully appointed rooms. You can check out our review here. Our preferred booking site is Trip.com for the best price on accommodation. Click here to book your own Los Angeles experience. For tours, we prefer to book through our travel partners Viator.com. For the cheapest deals on flights to Los Angeles, we book through our travel partners, Budget Air, who are currently offering $25 off the price of your flight. Click here to go to Budget Air to get the best deal on flights to Los Angeles. Our little experience with scammers in Hollywood was kind of scary. We don’t for a second think anything would have happened but it’s nice to know that if it did, our asses were covered. This is why we recommend you never venture out into the big wide world without travel insurance. We use Tick Travel Insurance for affordable, comprehensive insurance that gives us peace of mind when we travel no matter what happens. Pop over and try them on and see if they fit your travel needs.